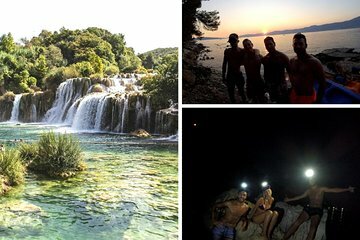 Combine two adventurous activities—a visit to Krka Waterfalls and nighttime kayaking around Split—in a single full-day tour. With all activities arranged for you, you won't have to spend valuable vacation time planning out the logistics. Stops include the Ethno Museum and old watermills, the country's first hydroelectric plant, and a boat tour on the Krka River. Your guide accompanies you to ensure your safety and comfort at all times; even beginners can participate.